Designed to fit all normal and small ear canals. Not recommended for large ear canals. Waterproof reusable ear plugs are one of the only removable filtered available on the market that are designed for shooting. They protect your hearing without interfering with your ability to hear routine sounds or conversations. Their triple flanged-stem design fits most people and provides a Noise Reduction Rating (NRR) of 29dB. Sounds, at safe levels, are allowed to pass through into the ear canal, while potentially harmful noises (above 85dB) are reduced via a proprietary design that incorporates a special easily removable high-impact noise-reducing filter. 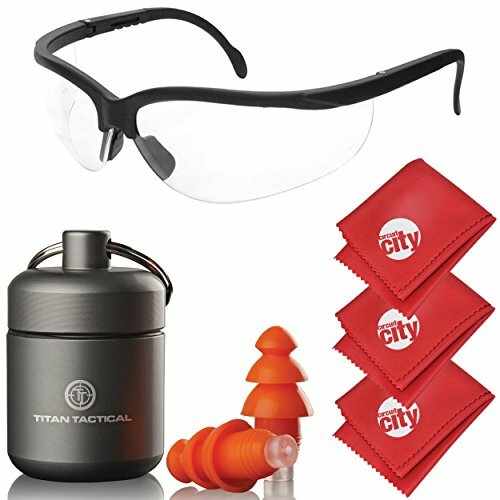 This high-impact filter in the stem of the ear plug acts like a trampoline for noises that occur with more force than regular sounds, thus making these earplugs an effective hearing protection solution for military, tactical law enforcement, hunters, gun range shooters, event shooting, construction, manufacturing, and maintenance applications. Radians Journey safety glasses provide excellent optics, impact resistance and 99.9% UVA/UVB protection. They have a 4-position telescoping temples for a superior fit and a rubber nose piece allows for all day comfort. High impact ballistic lenses are made to mil-spec MIL-PRF-31013 which is a .15 inch steel projectile impact at 660 feet per second. All lenses are also hard coated for scratch resistance. Circuit City 6x7" Microfiber Cloth for Glasses and Scopes(3). If you have any questions about this product by Titan Tactical, contact us by completing and submitting the form below. If you are looking for a specif part number, please include it with your message.